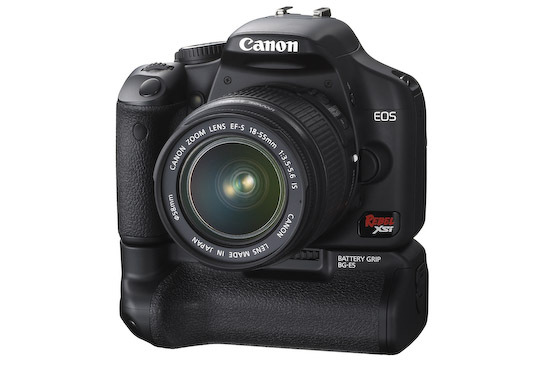 This past Thursday, Canon announced their newest DSLR, the Canon EOS Rebel XSi. This camera ups the ante for every entry-level DSLR out there and introduces a host of important new features. 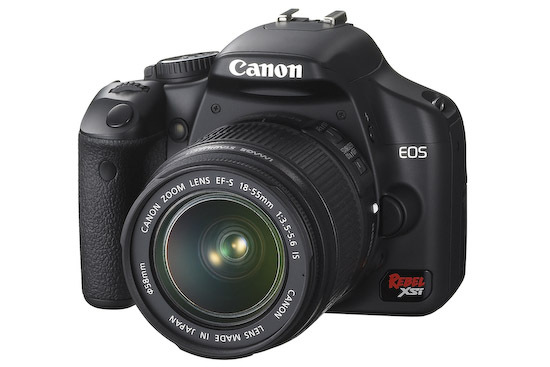 In a nutshell, Canon has integrated features from its more expensive DSLRs, like the DIGIC III processing engine and better AF, it has replaced the cheap-looking grip material with soft rubber, and it has increased the resolution from 10 to 12.2 megapixels. There are a number of other significant differences between the XSi and the XTi (which I reviewed a few months ago), and I’m going to talk about them below. XSi now uses SD cards instead of CF cards. This was a bit of a shock to me, but there it is. 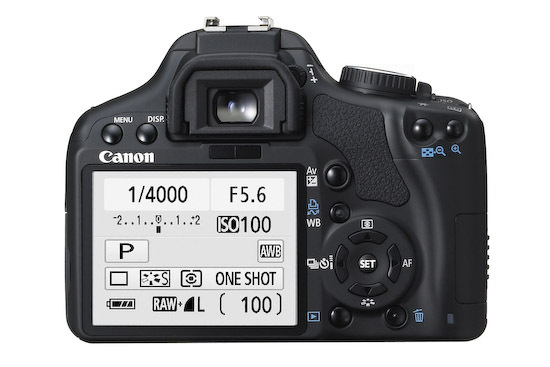 I suppose with such a small camera body, it made more sense, but I prefer CF cards, they’re sturdier. DIGIC III image processor: previously only available on the 40D and 1D series cameras. Highlight Tone Priority, High ISO Noise Reduction and Auto Lighting Optimizer are three features brought down from Canon’s more expensive cameras to improve image quality. Backup battery now built in, not replaceable. The backup battery is the one that keeps camera time. It used to be a CR2016 Lithium battery, now it’s listed as a built-in battery. Perhaps this is a specs typo, someone correct me if they have more accurate information. By offering the camera with two image-stabilized kit lenses whose 35mm effective combined range goes from 28.8-400mm, and by upping the resolution from 10 to 12.2 megapixels, Canon is clearly going after its competitors. It wants to continue to dominate the DSLR market, and with such an impressive entry-level DSLR, it will likely do so. The resolution itself is another mind-boggling upgrade. I didn’t think 12 megapixels would be offered in the Rebel or another entry-level DSLR so soon, particularly when the 40D only has 10 megapixels and the 5D (my current camera) is the reigning king at 12.8 megapixels, but here’s the XSi, and there’s no arguing with that figure. If nothing else, this means the new 5D “Mark II”, which is expected to be announced in April, will have at least 16 megapixels resolution, possibly even 18 megapixels. It’s only natural, given that the new 1Ds Mark III stands at 22 megapixels. Mistry, the 400D is the same as the Rebel XTi (not XSi). Please read my post on that camera, and pay particular attention to the comments, which is where I compare the 400D to the E-510. Actually wanted to go for digital SLR camera’s and basically confussed between two model i.e. CANON 400D and OLYMPLUS E-510, can you suggest which one is better?